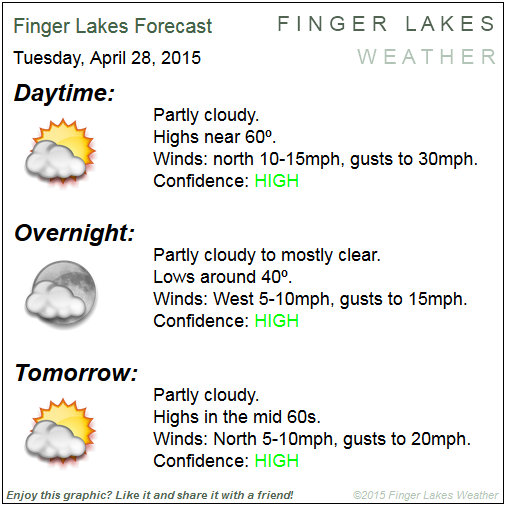 Temperatures will return to normal levels for the Finger Lakes after a week of chilly weather. Some more enjoyable weather will move back into the Finger Lakes as low pressure off the New England coast pulls away and high pressure builds in. As is often the case in this weather set up, some gusty winds are expected today, especially across the eastern Finger Lakes and eastern Southern Tier, where some gusts over 30mph will be possible. Another area of low pressure will lurk off the east coast later in the week, bringing some more showery, cool weather before a more significant warm up by next week.